Softbox, with its extensive, strategically-located network, provides a local supply of single-use, temperature-control, parcel shipping systems to the world’s Life Sciences industry. Ideal for clinical trial supplies and pharmaceuticals, our solutions are as revered as they are recognised. All are proven in the field and comply with strict industry regulations; shipper performances are thoroughly evaluated in our chamber testing facility and comfortably maintain commonly-used temperature ranges for durations of up to 120 hours. Our parcel shipper portfolio is particularly comprehensive. While there are commonalities in quality and performance, each is designed with different requirements in mind, bearing configurations that change size, weight, capacity and capability. All Softbox parcel shippers use a peripheral thermal installation layer which is then combined with either water-gel coolant packs or phase change materials to protect the temperature-sensitive nucleus of goods during transit. The components are then integrated with precise design features that allow for simple conditioning and assembly. 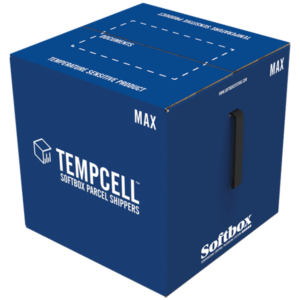 The Tempcell® MAX shipper is an upgraded version of its Tempcell® brother. An innovative, internal radiant barrier film has been added to enhance thermal protection. And advanced phase change material (PCM) coolants replace water-based coolants. This allows the temperature-stable operating bracket to function for 48 to 96 hours. PCM coolants are also capable of true end-of-life recyclability and contribute towards a lighter shipper, enabling cost-effective transportation. 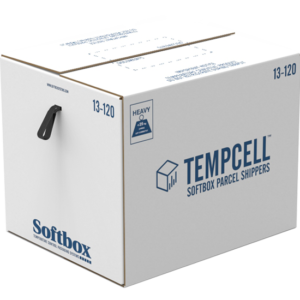 Tempcell® is a well-recognised, go-to temperature control parcel shipper for the Life Sciences industry. This fully recyclable brand now encompasses seven solutions in total. There are different dimensions, payload options (up to 60 litres), time performance differentials (from 48 to 120+ hours), and tare weights up to 45kg. Easy conditioning and speedy assembly make this shipper a hassle-free, economical shipping option.